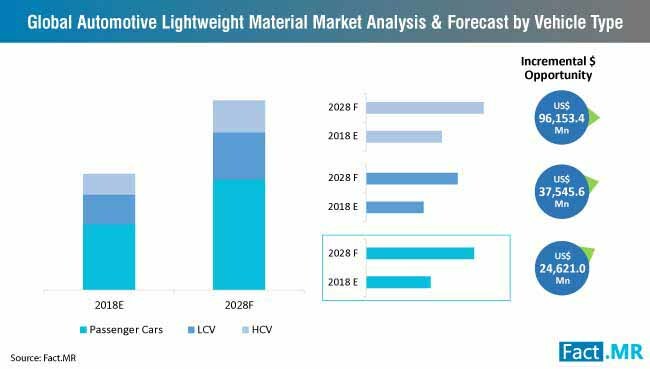 The automotive lightweight material market registered a volume CAGR of nearly 3% during 2013-2018. Aspects influencing growth of the automotive lightweight materials industry range from rising need to improve vehicle performance to concerns over energy consumption and carbon emissions. East Asia is expected to be the leading market for automotive lightweight material, with China accounting for bulk market share in the region. Total volume sales of automotive lightweight materials in East Asia exceeded 27 kilotons in 2018. 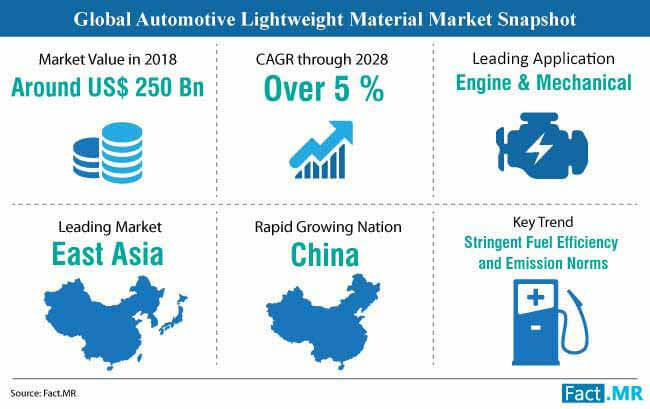 China is also likely to emerge as the high-growth market for automotive lightweight materials, with volume sales estimated to grow at a CAGR of nearly 5.0% through 2028. Sales will remain driven by steady demand from the country’s automotive industry. 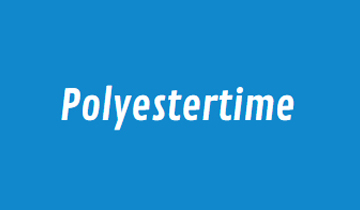 To gain more valuable insights into the automotive lightweight material, request a sample. What are the Key Dynamics Driving Automotive Lightweight Material Market Growth? Lightweight materials such as high-strength steel, aluminum alloys, carbon fiber materials, polymer composites, and others have been gaining wide-ranging adoption among automotive companies, to improve the fuel economy and reduce emissions without compromising on safety. With growing government initiatives worldwide to bring energy consumption and carbon emissions down, the concept of reducing vehicle weight has gained significant traction, which has eventually led to the expansion of automotive lightweight material market. As compared to heavy vehicles, the lightweight variants take lesser energy and offer added benefits to automakers and vehicle owners alike. Notable growth of the automotive lightweight material market is likely to be fuelled by surge in replacement of heavy components with automotive parts made from lighter materials which help reduce overall vehicle weight by 10%-60%. Automotive lightweight materials have been deemed to have greater energy absorption capability, which provides high protection upon impact. In addition, automobiles with light components are considered to perform better in poor road conditions, as the weight does not force the vehicles down. Such factors are likely to work in favor of the automotive lightweight material industry. 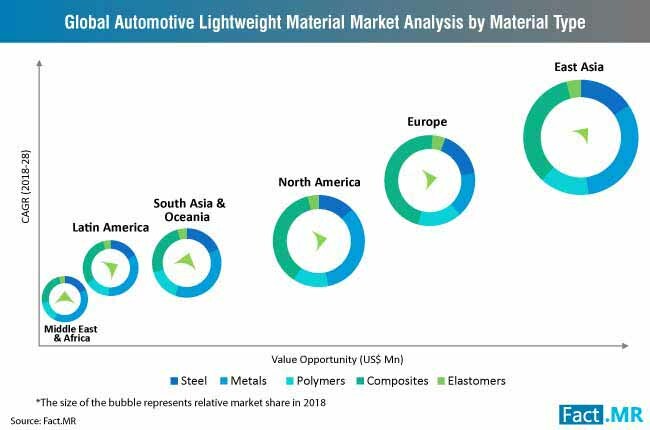 Surging demand for automobiles, along with proliferating vehicle parc, especially in emerging economies, on the coattails of rapid urbanization, increasing disposable income, and high purchasing power are likely to impact growth of the automotive lightweight material market. The upward trend of vehicle electrification and gradual surge in the number of electric vehicles have meant that lightweight components will continue to remain sought-after in the automotive industry. This will significantly contribute to sales of the automotive lightweight materials in the upcoming years. For more detailed insights on growth drivers of automotive lightweight material market, request a sample. What are the Key Challenges Limiting the Growth of Automotive Lightweight Material Market? High cost of sourcing the raw materials such as carbon fiber, titanium, and magnesium, continues to remain a key concern among players in the automotive lightweight materials market. 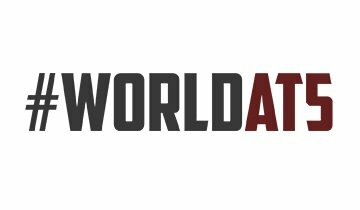 Limited availability of premium raw materials such as titanium and magnesium, which are extracted from the earth’s crust in developing nations may confine growth of the automotive lightweight material market to a certain extent. In February 2019, Tata Steel Ltd. was named one of the ‘World’s Most Ethical Companies’ in 2019 by Ethisphere Institute for the eighth time. The company won the coveted recognition in category of ‘Metals, Minerals and Mining’. 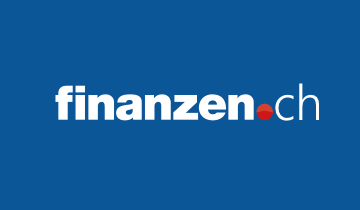 In September 2018, LANXESS, a Germany-based specialty chemicals company, announced to build a new production unit at its Krefeld-Uerdingen site with an aim to expand its global production network for high-performance plastics. By the latter half of 2019, the company plans to produce Durethan and Pocan engineering plastics, which are used in electronics and automotive industries. 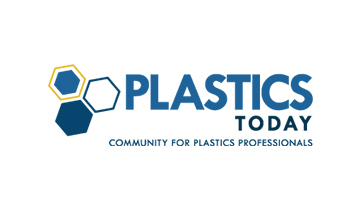 In July 2018, LyondellBassel, a leading player in the automotive lightweight material market, announced that it signed an agreement with Karlsruhe Institute of Technology to advance the chemical recycling of plastic materials and support the global efforts towards circular economy and plastic waste recycling needs. 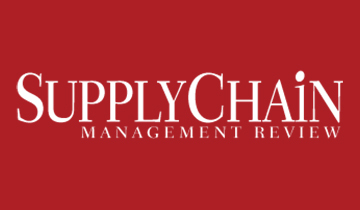 The company acquired A. Shulman in a US$ 2.25 billion deal in February 2018. 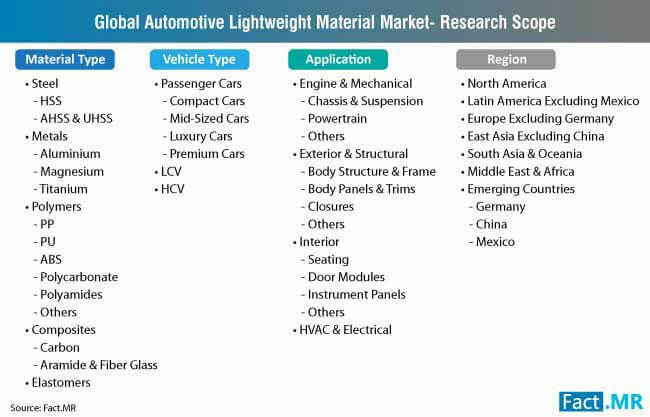 Other key players operating in the automotive lightweight material market include United States Steel Corporation, ThyssenKrupp AG, Formosa, Trinseo, LG Chem, JSR, Eastman, Alerisw International, Guirt Holding AG, SGL Carbon SE, Teijin Limited, Hunstman, ExxonMobil, Covestro, Mitsubishi, DowDupont, DSM, Solvay, SSAB AB, Ak Steel Holding Corp, Nucor Corp, Trinseo, Luxfer, Kaiser, Hindalco, Braskem, UFP Technologies, Owen Corning, Asahi Kasei Corporation, Ineos, Chevron Phillips, SABIC, Toray, Celanese, BASF, POSCO, Baoshan Iron & Steel Co., Ltd, and ArcelorMittal SA. The study opines that steel will account for a sizeable share of the automotive lightweight materials market. Steel sales for lightweight automotive components surpassed 34 kilotons in 2018, and are estimated to record at a volume CAGR of 3.9% through 2028. Sales of the automotive lightweight materials will remain comparatively robust in the production of passenger cars, accounting for a significant volume share in 2018. Additionally, growing incorporation of the automotive lightweight materials in manufacturing the engine, exterior components, and interior components of luxury cars will continue to underpin the sales of automotive lightweight materials in the near future. 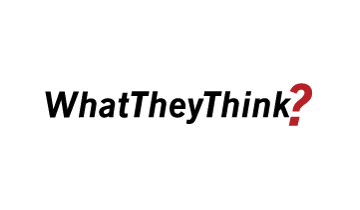 In-depth analysis and exhaustive insights provided in the Fact.MR report on global automotive lightweight material market is a result of a two-step research process that involves primary and secondary resources. In the secondary research methodology, trade journals, paid resources, company annual reports, press releases and other publications related to automotive lightweight material market were studied in order to gain information and market size data. The information obtained has then been validated through insights gained from the primary interviews with industry leaders and the market experts. Findings from these research processes were used to determine an accurate and all-inclusive forecast of the automotive material market for the period 2019 to 2028.